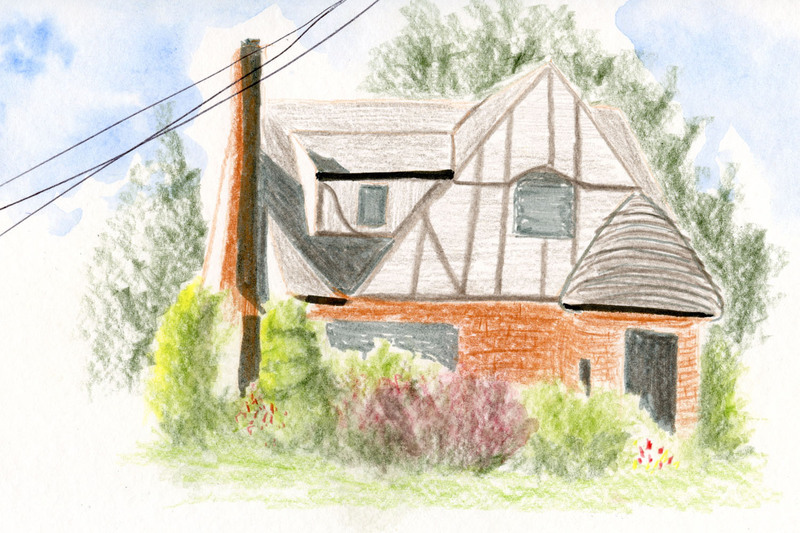 Given the number of Tudors I keep sketching, maybe I should just make this a series about Tudors instead of about Maple Leaf neighborhood architecture! We do have other types of houses, though. . . these just happen to be my favorites. The last time I sketched the Fremont Troll, it was on a scorching summer day last year when the shade of the Aurora Bridge and a soft breeze had kept several urban sketchers comfortable. 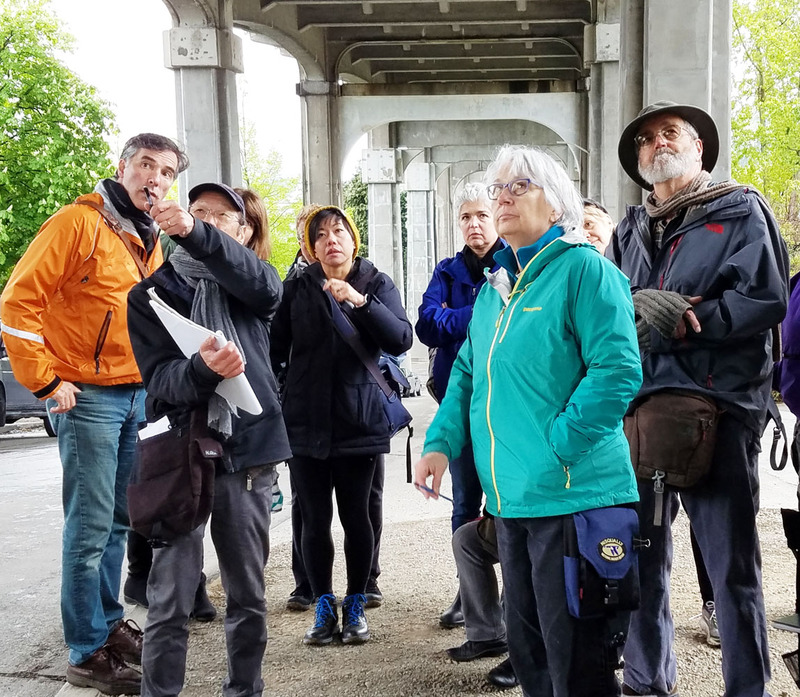 Yesterday morning, 12 students in Frank Ching’s workshop sought shelter under the same bridge – this time from rain instead of sun. 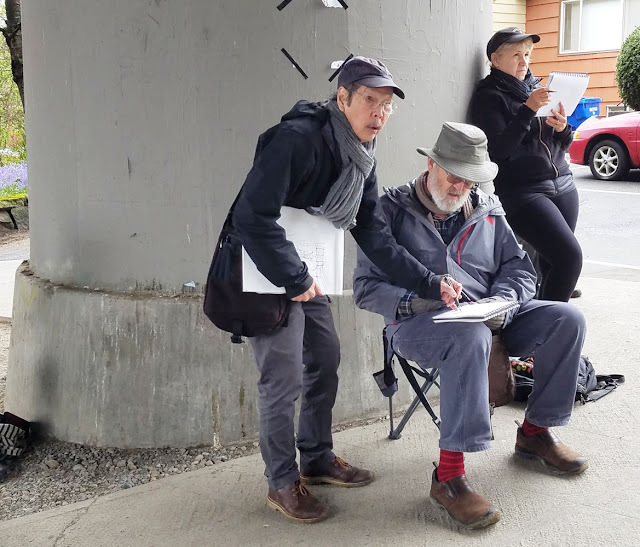 Under the Troll’s watchful eye (singular), Frank talked about “Locating, Framing and Composing Views” in urban sketching. By the time I got there, the heavy rain had slowed to a drizzle, but the weather still wasn’t exactly hospitable. 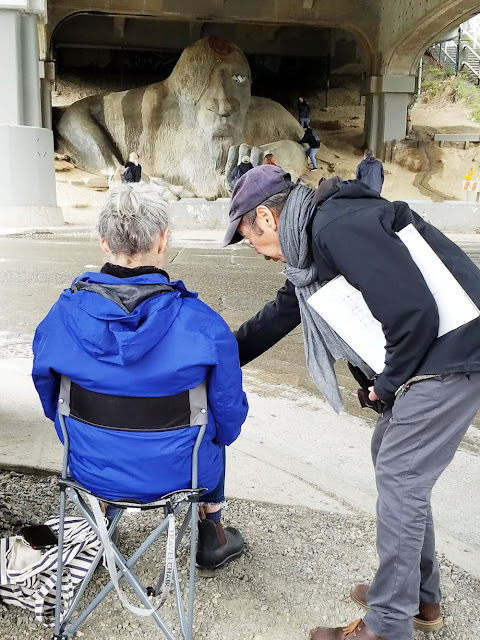 After snapping a few photos of Frank and his students, I was going to leave, but then the Troll caught my eyes (plural). Although I’ve sketched him several times, I couldn’t resist another quick one. After a phenomenal week of sunshine and record-breaking heat on Thursday, Friday dawned cloudy with a chance of rain, which normally would have been disappointing for our sketch outing in West Seattle. 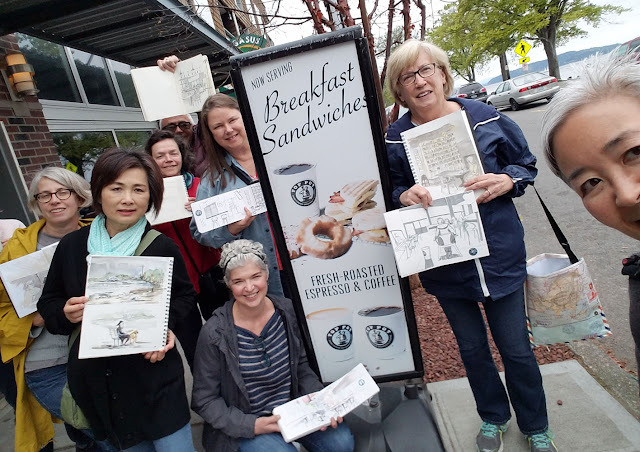 I was eager, however, to apply the concepts I learned last week in Andika’s workshop, so I didn’t mind staying indoors at Top Pot Doughnuts. It was only after I sat down with coffee and an apple fritter and looked around the room that I began to realize something strange: Top Pot has no right angles! The walls, the almost-L-shaped bar, the funky, partially rounded ceiling trim – everything is slightly askew. Fortified with fat, sugar and caffeine, I attacked the room, grumbling and occasionally muttering, What would Andika do? I had planned to put at least some of my doughnut into the sketch, but it took me a full two hours to do the sketch, so the doughnut didn’t have a chance. My group selfie is as crooked as the room I sketched. 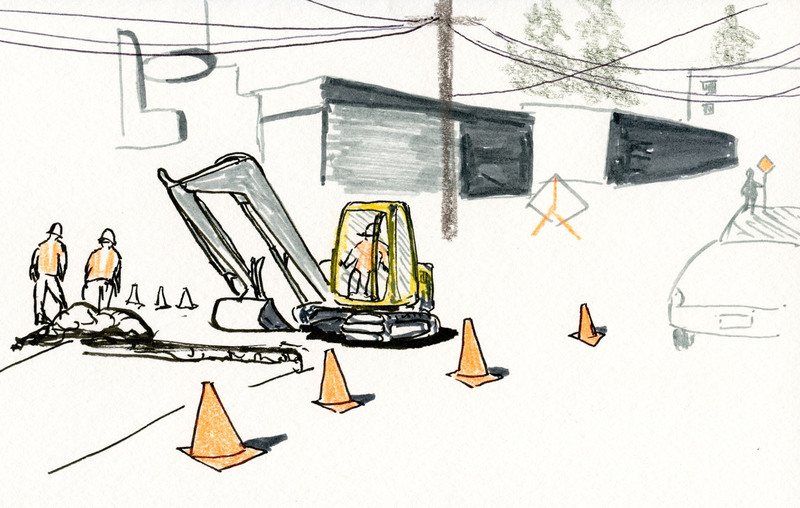 This is one of the excavators I sketched on its day off last Sunday. It’s been busy ever since, digging a big hole on Roosevelt Way in front of Maple Leaf Park. 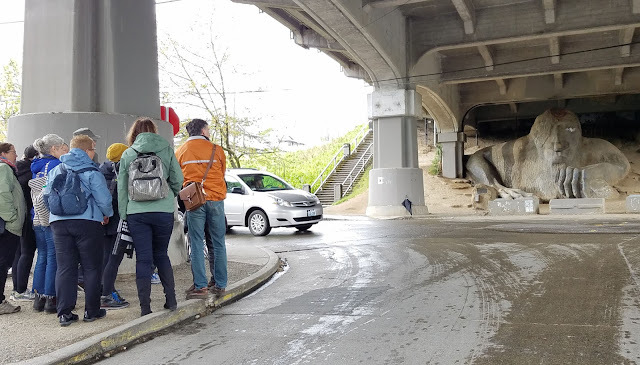 I was told by the curious workman who came by to see what I was doing (he thought I was from the city, EPA or some other agency to check on the work) that the main project is to make the busy arterial safer for crossing pedestrians. The big hole, though, is related to sewer work that has to be dealt with before the other work can be done. This project could go on for a while. I think it may be worth another sketch or two! Stay tuned. My plan on this morning was to sketch one of the frame Tudors on 83rd, where there’s a whole row of lovely ones on one block. But I must have been distracted, because I found myself walking on 82nd instead, where there’s a whole row of even more charming brick Tudors. This is the plainer type without a conical roof over the porch, but it still has some nice details in the brickwork around the arch (which, unfortunately, I couldn’t capture on the shady side). I might have to go back and sketch the house next door to this one from the side, which has a very cool chimney detail. I’m going to have to get out there at least an hour earlier, though, so the light will be just right. I know I promised to show the many traditional architectural styles in Maple Leaf. . . but I sure love these Tudors! The American Craftsman style of architecture is common in the Maple Leaf ‘hood. Before we added an upstairs, our frame house looked very much like this one – simple details and a small porch flanked by plain, round columns. Greg calls this type “the poor man’s Craftsman home,” as we’ve certainly seen much larger ones with exposed rafters and big porches. If I’d had my choice back when we were house hunting eons ago, I would have picked a brick Tudor over a Craftsman, but I do like the clean, classic look of this house (and ours). I think Reckless Video, which I sketched several years ago, is also in the Craftsman style. On Sunday afternoon I took a walk in the sunshine through the neighborhood. 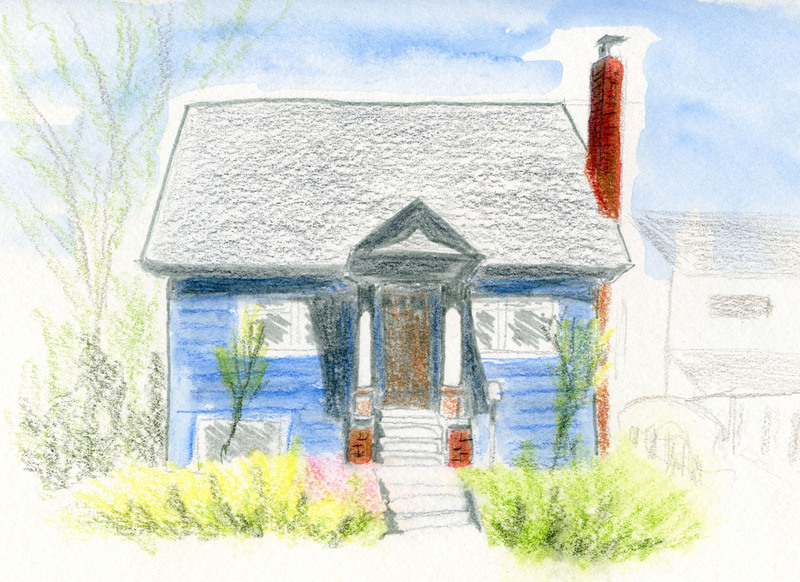 My goal was to make note of architectural styles that I want to sketch for my series on Maple Leaf houses. 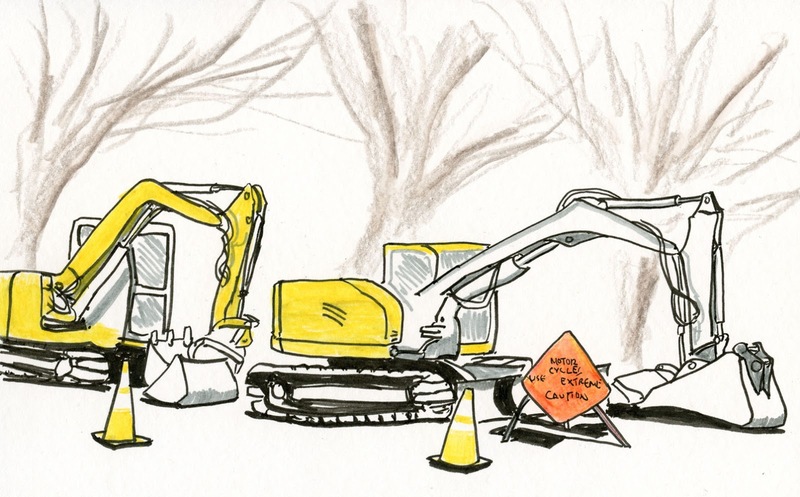 I didn’t get very far, though, because I found this pair of excavators, which look like yellow praying mantises, resting on Roosevelt Way. Somehow heavy equipment is always more seductive than houses. By the way, despite the sunshine, those trees behind the excavators were still as bleak and bare as winter. I’d feel more confident that spring were really here if all the trees were leafed. Maybe this week’s expected warm temperatures (77 on Thursday?!) will help. Last week when I started to criticize a new house under construction for not fitting in with our neighborhood’s architectural style, I realized I should let you judge for yourself by showing you some of that style. 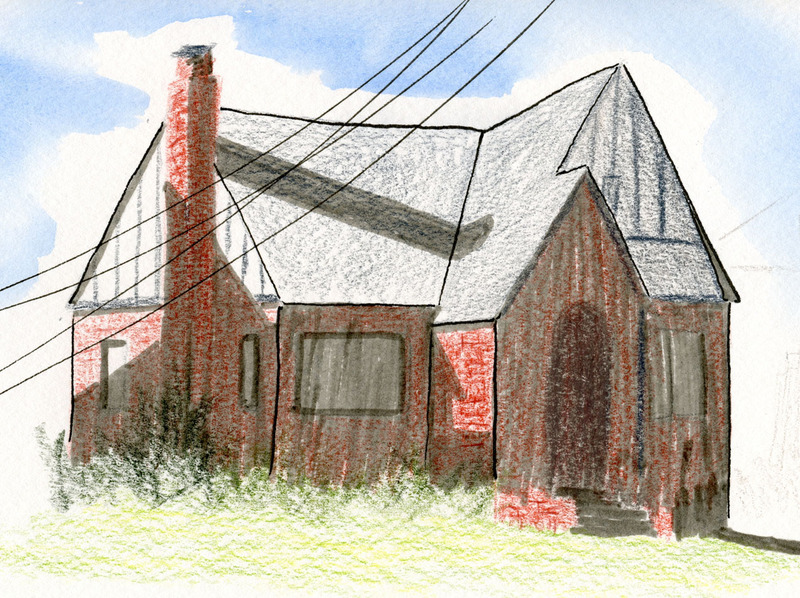 This is the first of what I intend to be a series of sketches of typical home styles in the Maple Leaf neighborhood. This is one of my favorite houses on our street. 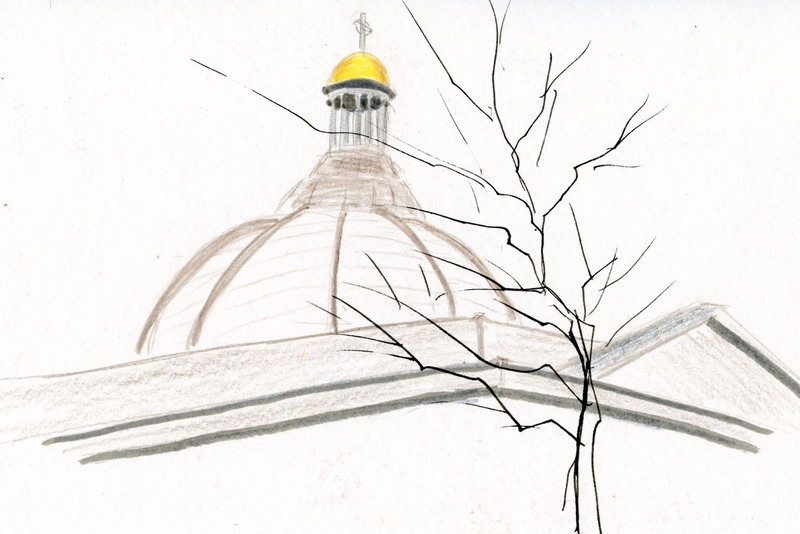 I walk by whenever I catch the bus, and I always admire that lovely conical-shaped roof over the porch which gives it a storybook cottage look. Thirty years ago when we were house hunting in the neighborhood, we hoped to find a Tudor-style house like this, but there weren’t any available in our price range. It looks serene, doesn’t it? However. . .
Just behind me as I sketched next to a huge dumpster, a house was being totally gutted by several men who were shouting to each other as well as into their phones (set on speaker) while music blared from a radio. Every now and then that cacophony was further punctuated by a pneumatic hammer. Someday I’ll sketch what’s going on over there, too. Andika shows us how he makes confident lines. “Sketch ‘n’ Chill,” the title of Andika Murandi’s USk Seattle 10x10 workshop, is irresistible: Who doesn’t enjoy sketchin’ and chillin’? And the subtitle is even better: “No-stress interior sketching.” I’ve long admired Andika’s sketches of interior spaces that convey depth and complexity and yet stay small and simple. His workshop would be a good opportunity to learn his approach. I signed up immediately! 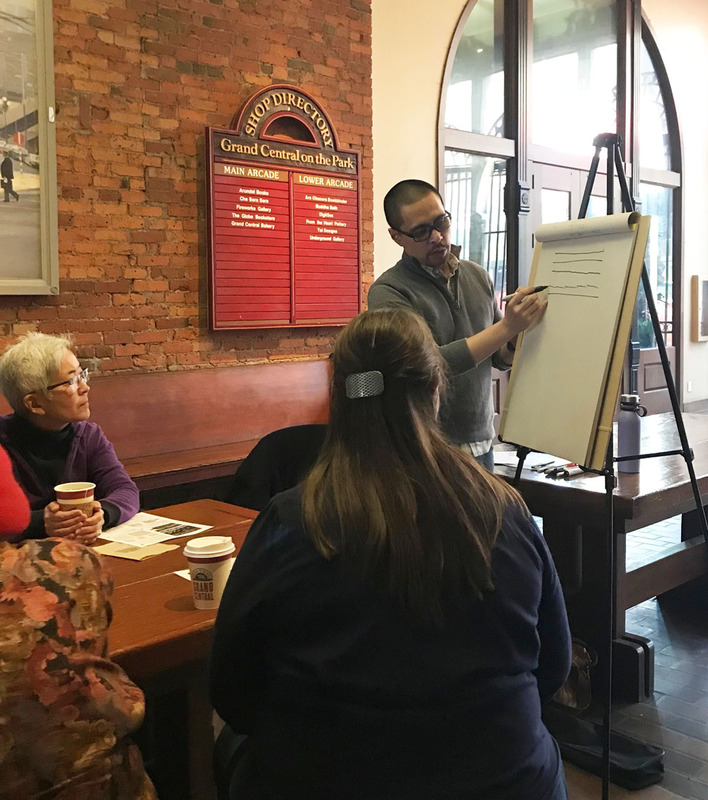 For the first half of the workshop, we met in Pioneer Square’s Grand Central Arcade, where Andika led us through practicing the very basics of any kind of drawing: making bold, confident lines instead of jaggy, tentative ones. By moving the whole arm and shoulder, not just the wrist, even when drawing in a small sketchbook, lines will be more controlled, continuous and consistent. 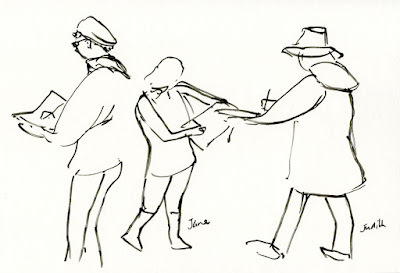 He urged us to forget about erasing tentative pencil lines; instead, he encouraged going straight in with ink and “embracing the mistake.” To reinforce this attitude, he showed us examples from his own sketchbook where he had made incorrect lines initially and then restated them, but left the old lines in place. When he pointed them out, we could see the “wrong” lines, but they otherwise disappeared into the rest of the composition, which was confidently presented. Rooms can be simplified into trapezoids, rectangles and triangles. 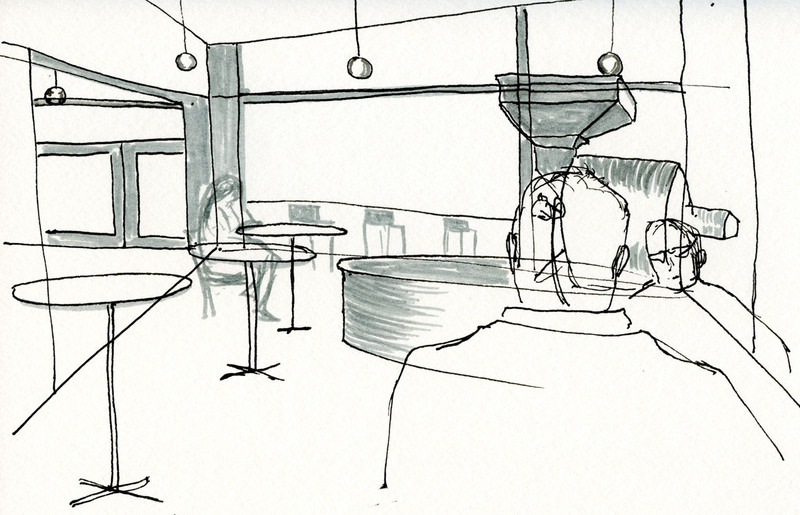 As an architect, Andika pays attention to perspective in his sketches, yet with a casual, “no stress” approach. 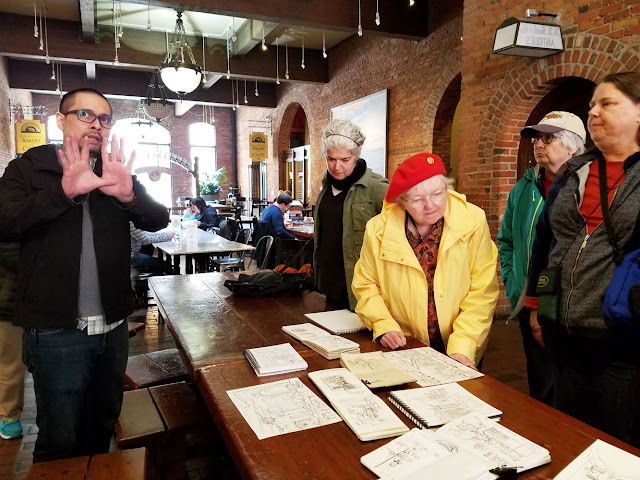 Most traditional lessons in perspective drawing begin with illustrations of one-point or two-point perspective in which the point where all those lines meet might be way outside the composition and halfway down the street. 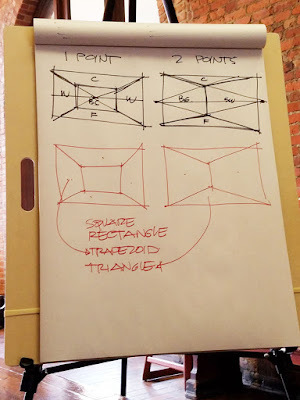 Instead of starting with a horizon line and vanishing point, he showed us how interior spaces can be simplified into rectangles and trapezoids (one-point perspective) and triangles and trapezoids (two-point perspective). Once you see those basic shapes in a room and form a composition around them, the rest is just details. Stress-free perspective! 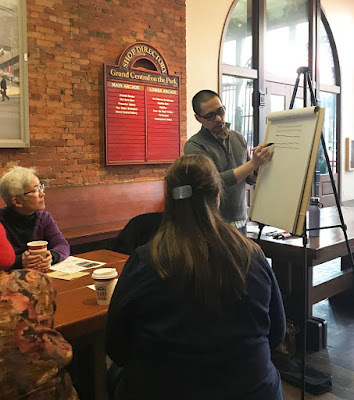 Before taking this workshop, my usual approach would have been to focus first on the two men sitting in front of me, then add the roaster, tables, chairs and other details around the men, and finally fill in the windows and walls in the background. But often what happens is that my scale or placement is off on the tables and chairs, so when I put in the walls and windows behind them, the whole room tends to skew. With Andika’s approach, the first lines I made were the shapes of the trapezoids and triangles of the walls, ceiling and floor. Although I probably didn’t get the perspective perfectly accurate, when I used those lines to guide the placement and scale of the details, they tend to look right. 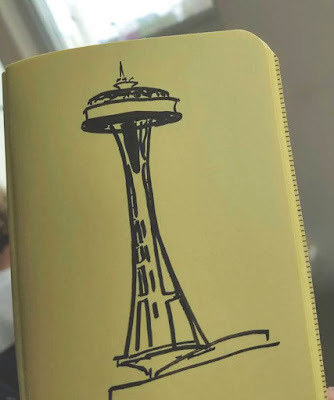 Similar to Gabi’s “Pocket Urban Sketching” concepts or Sue Heston’s “sky shapes,” both learned in last year’s 10x10 workshops and that I find myself using often, Andika’s simple, straightforward approach is one that I could grasp easily in an hour and then practice immediately for reinforcement. 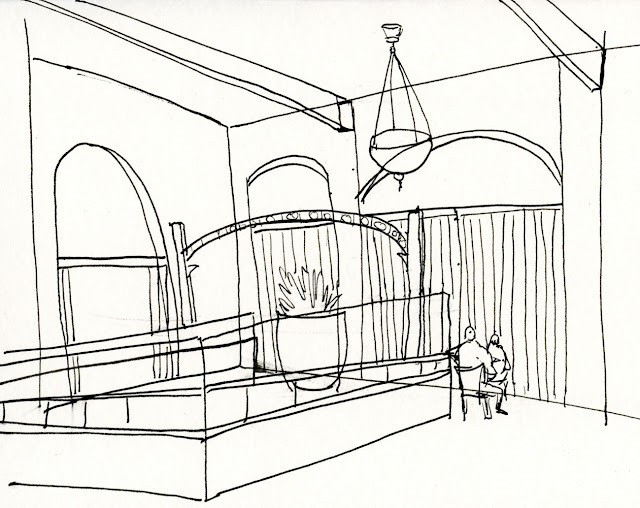 I left the workshop feeling confident that I could use his approach for interior spaces whenever I want to show the whole room – without thinking about where all those perspective lines eventually meet up. Sketch ‘n’ chill, indeed! 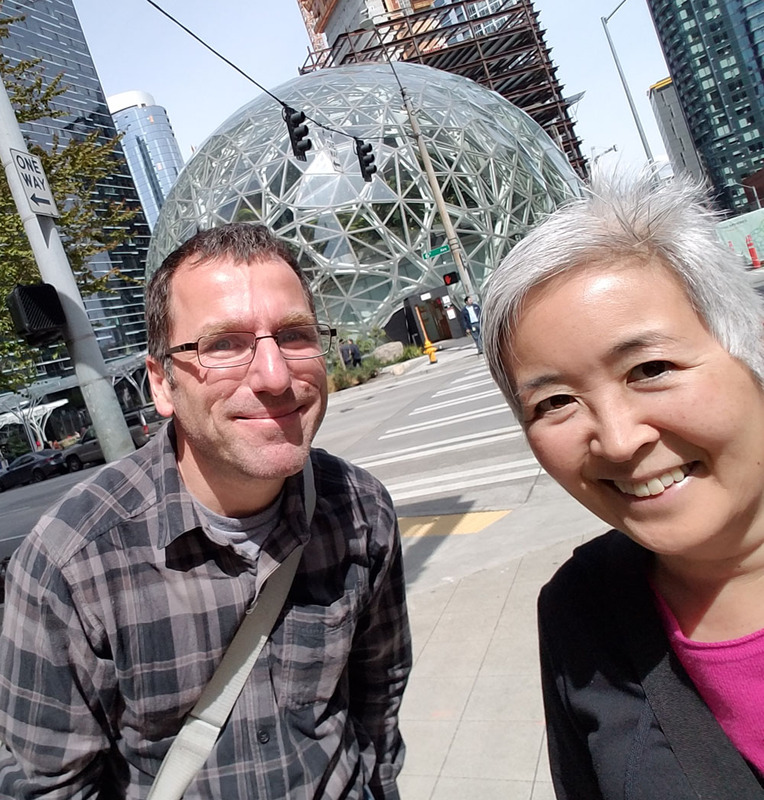 Whenever I’m in the South Lake Union area, it’s hard to resist the Amazon Spheres. I’ve sketched them inside and out several times, but I’m still not tired of them. 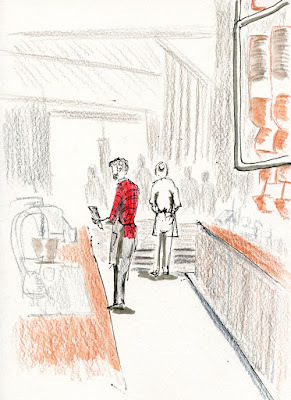 A few days ago I met Gabi Campanario for a working lunch (we’re both members of the USk Editorial Team) by the spheres. After the meeting I stood near the same spot where I sketched this scene while taking Gabi’s Pocket Urban Sketching workshop last year. Before then, I’d always had difficulty viewing a vast scene like this and fitting it all onto a small page. 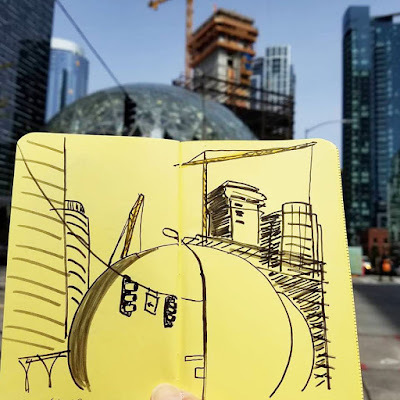 A couple of simple yet important tips – such as using the vertical line of a building as a measuring unit to gauge the rest of the composition – made the task far less intimidating. I still use those tips every time I am faced with a scene like this. 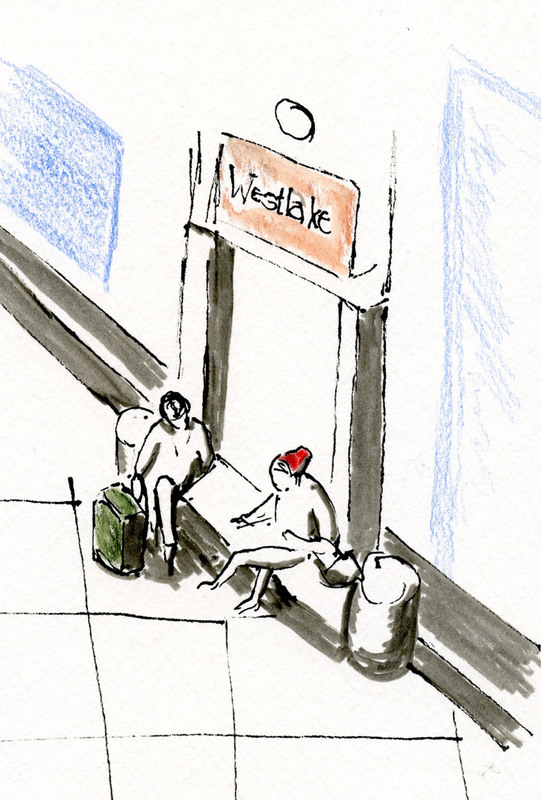 In the first chapter of The Pencil Perfect, author Caroline Weaver talks about the discovery of graphite in the 16th century in England’s Lake District. Though numerous pencil manufacturing companies were in the area at one time, the only one still remaining is Derwent. 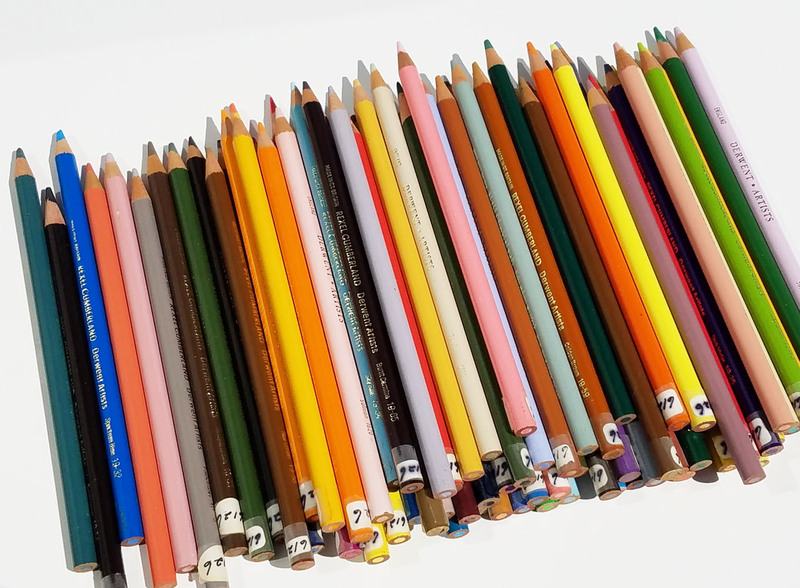 The company even has a museum for pencil aficionados – The Derwent Pencil Museum in Keswick – which is home to the world’s largest colored pencil (26 feet long)! Derwent obviously has a long, proud history in pencil production. According to Wikipedia, the company we now know as Derwent began in 1832 under the name Banks, Son & Co. The company was eventually purchased by Acco UK (known then as Rexel) and became a brand of their product range. This company would pass through several hands before becoming the Cumberland Pencil Company in 1916. A huge, lovely set of vintage Rexel Cumberland Derwent pencils recently came my way – a generous gift from someone who knows that I eat and breathe colored pencils. I contacted Derwent to see if I could learn approximately how old my set is, but I didn’t get a response. But I found at least three versions of branding in the hefty collection. 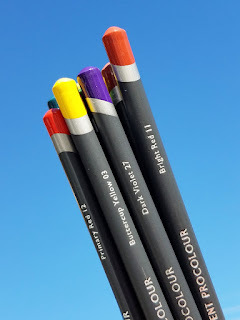 Interestingly, one is Derwent Artist, which is still the name of a Derwent pencil line, but the contemporary Derwent Artist pencils I have tried are much harder than these. Compared to Derwent’s vast range of contemporary colored pencil lines, these Rexel Cumberland pencils have a very different appearance. 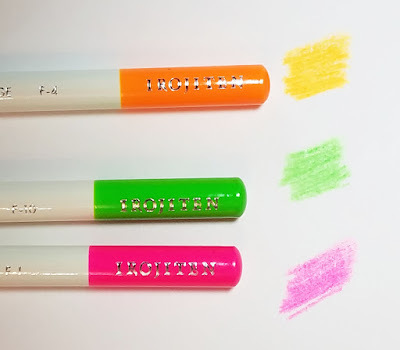 For example, the contemporary Inktense, ColourSoft and Procolour (at right) lines all have a solid-colored round barrel with only the end caps indicating the core’s color. This design is consistent with all of Derwent’s current collections. On the vintage Rexel Cumberland pencils, however, the full length of the round barrel matches the core’s color, and the end is unfinished. It looks very similar to Prismacolor’s long-standing design. Enough about design; we all know that the most important aspect of any pencil is its core. When I initially swatched these, I was astounded by how deliciously soft and creamy they are. 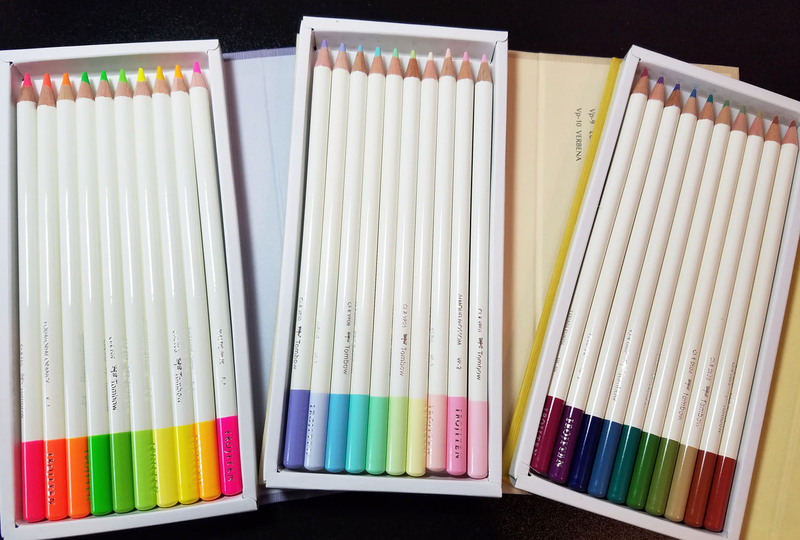 They are probably as soft as any colored pencils I own, including Caran d’Ache Luminance and vintage Berol Prismacolors. 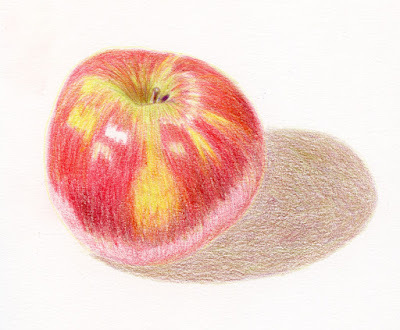 In fact, I’d say they are most similar to my old Prismacolors in softness, application and even appearance. My curiosity immediately led me to trying to figure out which contemporary Derwent line was the successor to these very soft Cumberlands. 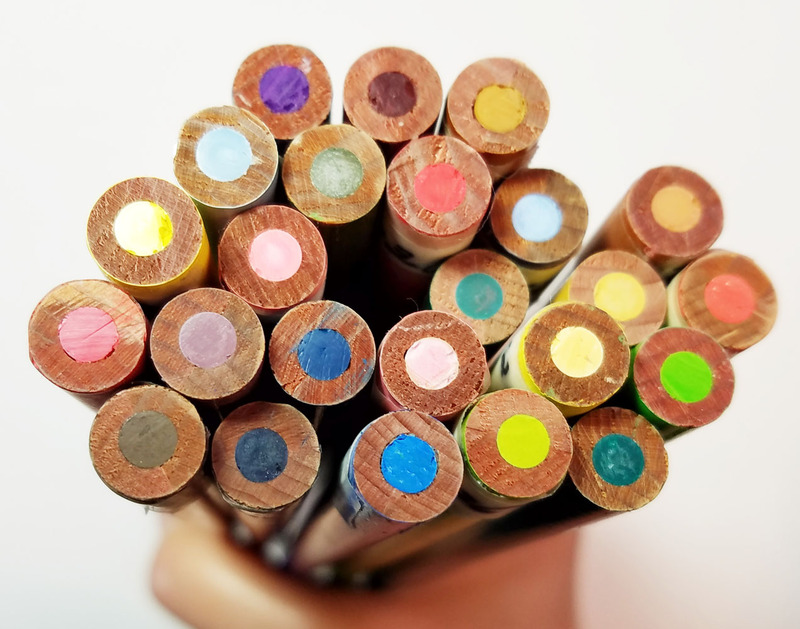 ColourSoft and Derwent’s newest Procolour line were the likeliest candidates. They all have a 4mm core. ColourSofts feel slightly drier than the Cumberlands and also produce more dust. The Cumberlands are close to Procolour in softness – perhaps even slightly softer and with a creamier texture. 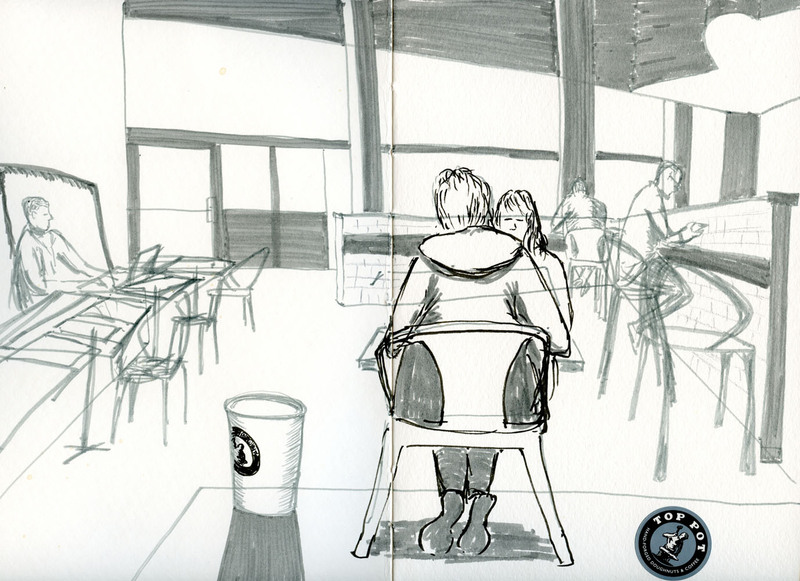 For my apple sketch, I used a smooth Stillman & Birn Epsilon sketchbook. As I expected from initial swatches, the Cumberlands blend beautifully, and it’s easy to build up layers of rich color. They are the kind of pencils I like to use at life drawing, so I grabbed several and took them to Gage a few days ago, where I used them on all the 10-minute and longer poses. I don’t know how long these Cumberlands have been out of production, but despite the number of similar pencil lines the company now makes, none of them is exactly the same as these. Thanks, Ana – I’m very happy to have and use them. A new house is under construction a block away from mine. This is the same construction site where I sketched an excavator a couple of months ago. My plan was to sketch more of the various types of heavy equipment I’ve seen on the property the past several months, but most of that occurred during our long stretch of cold and rain, and parking wasn’t allowed nearby, so I missed all of that. 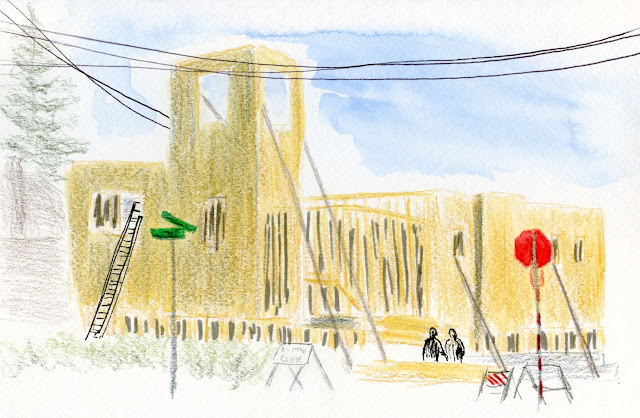 Yesterday it finally warmed up a bit, so I took advantage of the dry day to sketch the site. I’ll reserve final opinion until the house is completed. For now, let’s just say that based on what I can see of this elevation, the house doesn’t quite fit the rest of the neighborhood. But how would you know? 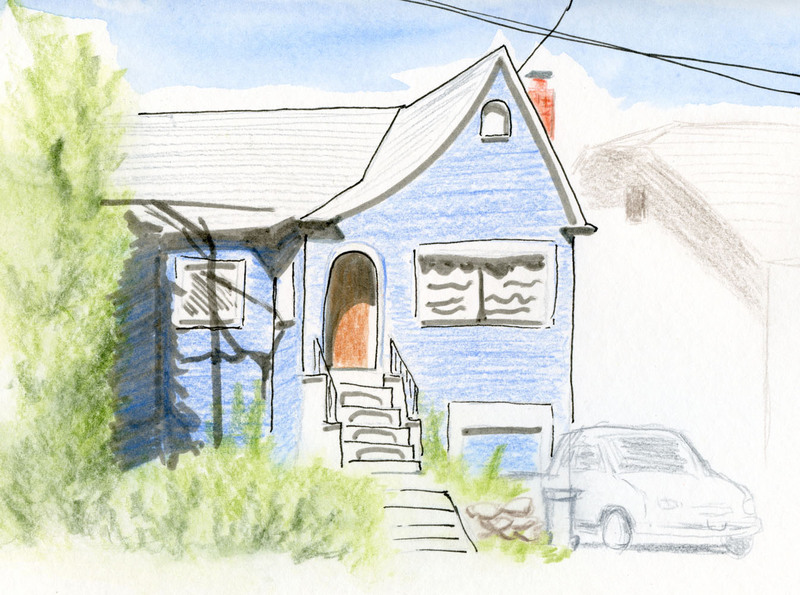 Other than The Maple Bar and Reckless Video, both neighborhood businesses occupying traditional houses, I’ve hardly sketched any houses in my ‘hood. I suppose familiarity breeds contempt or at least invisibility, because I don’t really “see” the houses I pass every day (or for that matter, the one I live in). I’m going to remedy that. Now that it’s finally feeling more like spring, I’m going to start sketching some of the homes that are what I consider typical and traditional of this area. Perhaps by then this new house will be done, and you can decide for yourself whether it belongs in Maple Leaf. 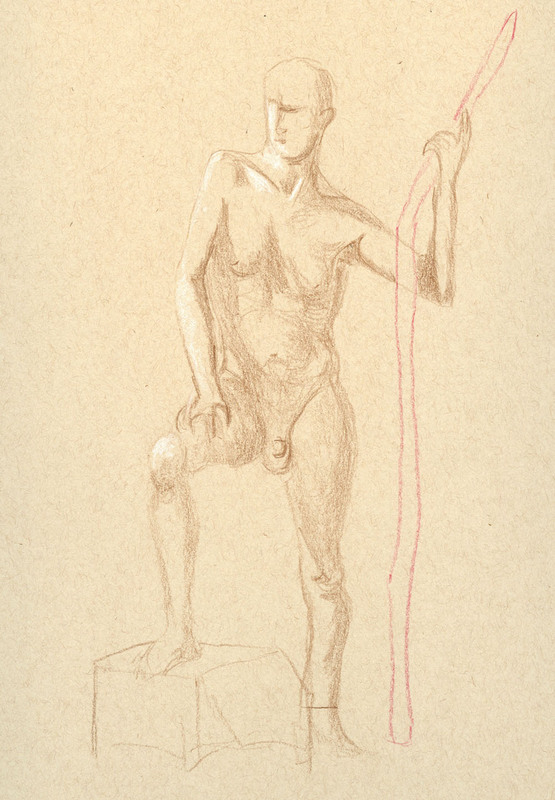 Yesterday when I wrote about lightning sketches, I totally forgot to mention one of the best ways to train for them: life drawing. 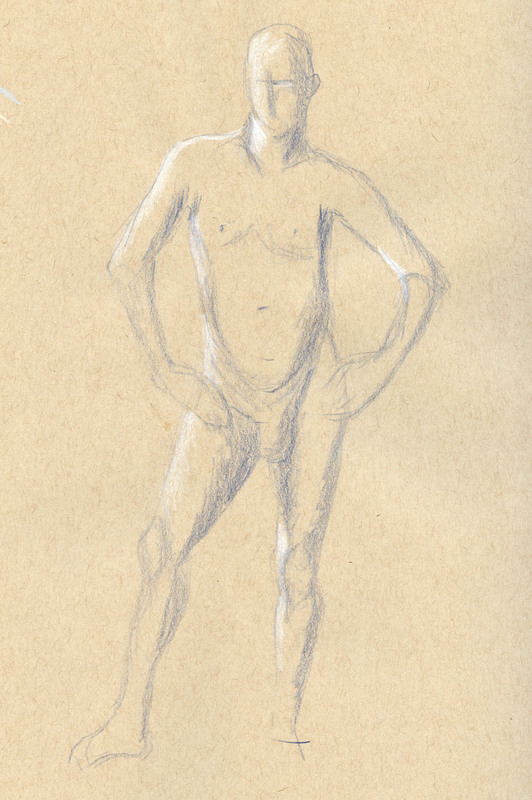 My primary motivation for going to figure drawing sessions is that the regular practice strengthens my eye and hand for human gestures and proportions, which is very helpful when I’m sketching people “in real life.” Of course, drawing a posed model who is absolutely still for one to 20 minutes is a total luxury compared to drawing “real” people, who tend not to hold poses at all (unless they’re busily preoccupied with their devices). I think the greater benefit, though, in terms of teaching me to sketch faster, is that I become more adept at gauging how much of a sketch I can do in a given amount of time. 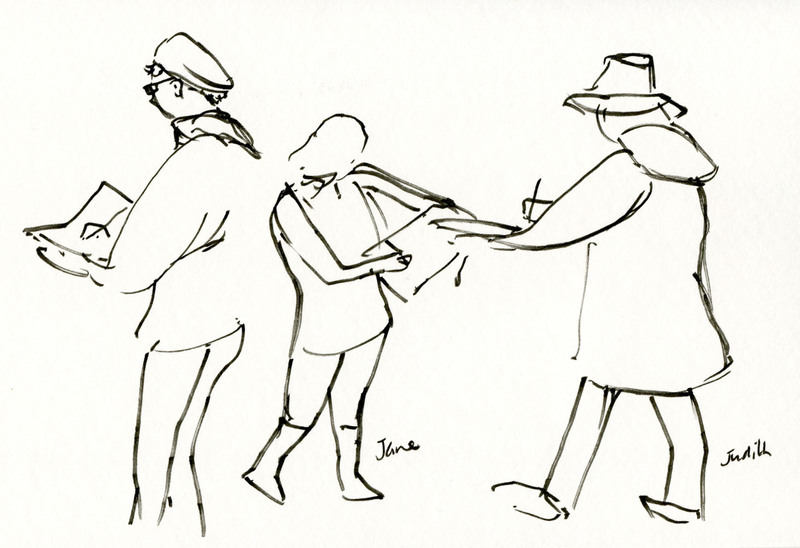 Shown here are a few sketches done from one-minute poses (above) and two others from two-minute poses (below). There’s not much difference in the amount of detail I included, yet I used the full length of time in each case. During the one-minute poses, I’m moving my hand and arm as fast as possible and sometimes I don’t get all of the model’s limbs, but I at least try to complete the gesture so that it’s clear what the model was doing. During the two-minute poses, I’m doing the same thing, but I can move my hand and arm a little more slowly, hopefully gaining a bit more accuracy in proportions. With two minutes, I am able to get all the limbs in, and the gesture is always complete. They don’t look very different, but from regular practice, I have trained myself to know how much slower I can draw (twice as slow!) when I have two whole minutes compared to one. I also always choose a brush pen for these very short poses because a liquid medium is easier to move quickly compared to a dry one. 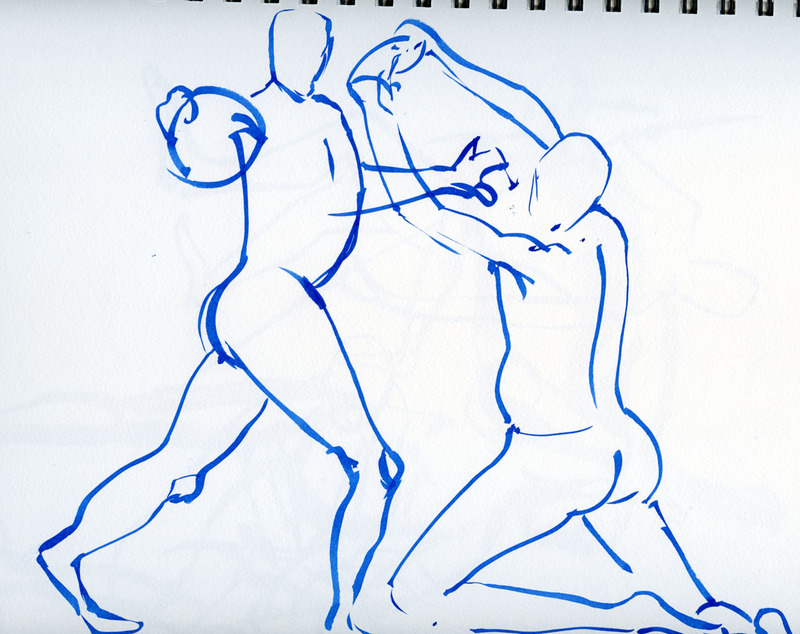 Shown below are sketches made from 10-minute and 20-minute poses. With these time lengths, I can choose a slower medium (colored pencil), put in a bit more detail, and define the forms more completely through shading and highlights. In both poses, I used the full amount of time for each, so I should be training myself to know how much of a sketch I can make in those time spans. But am I? Having 20 minutes is downright leisurely, both at life drawing and in “real life” drawing, and lately I have developed the bad habit of overworking a 20-minute sketch beginning around the time a 10-minute one would have ended. A 10-minute pose seems to be my sweet spot for capturing proportion, gesture and form. I could just stop after 10 minutes and start a new sketch to fill the time slot. 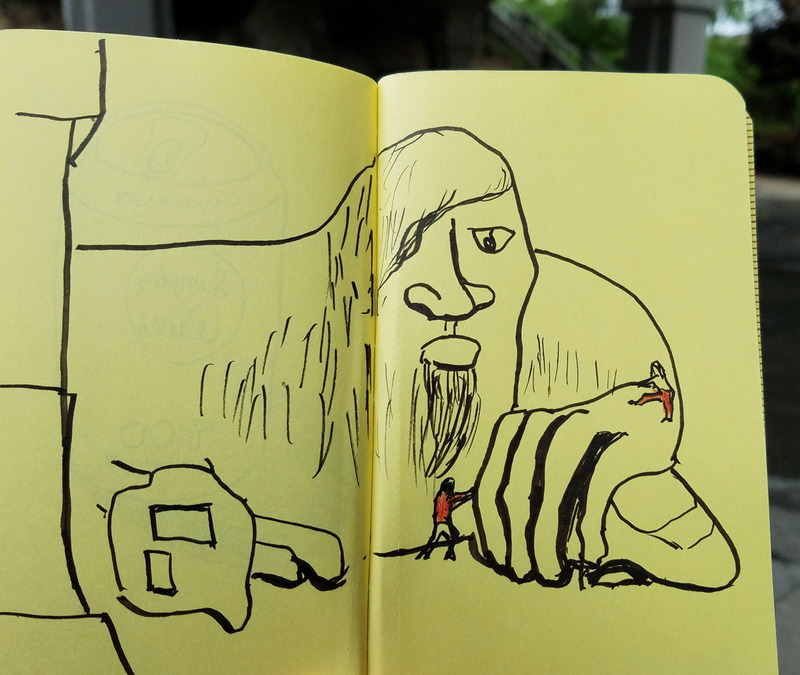 But I’d rather learn how to make a stronger 20-minute drawing. Today’s insight: Maybe I’ve gotten so good at sketching at lightning speed that I don’t know how to sketch more slowly! This is definitely something to work on. Several years ago I posted about the necessity of making “lightning sketches” when sightseeing with people who aren’t sketchers. I don’t want to keep companions waiting, so I’ve figured out strategies for sketching very quickly. Keeping materials, compositions and subject matter simple is a primary strategy, but just as important is adjusting one’s expectations and, when possible, planning for potential opportunities. 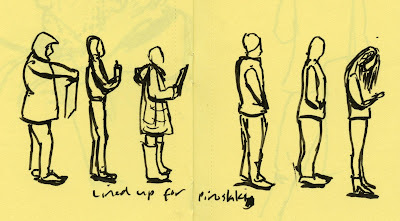 Recently I started thinking about all the many day-to-day situations (or to look at it a different way, opportunities) in which lightning sketches are necessary – not just when I’m with others whom I don’t want to keep waiting. When I think my subject matter may depart (people, animals, cars) or change (natural light, weather conditions) at any moment; when I’m due somewhere and have only a moment or two to spare; when I’m waiting for something else to happen, and once it happens, my sketch time is over. These types of situations happen way more often than having a leisurely few hours to spend as long as I like on a sketch. One day last week was filled with opportunities like that. 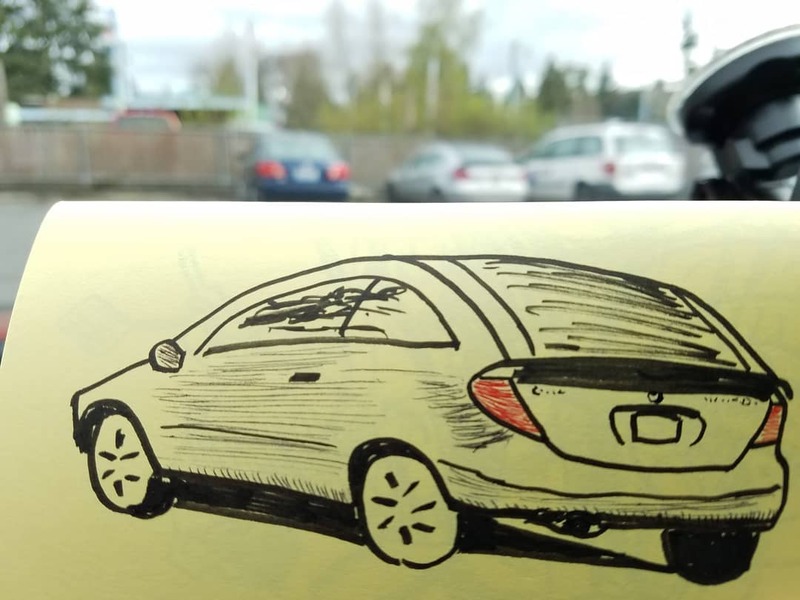 First, I went to the post office, and I had only a few minutes before I needed to run the next errand, but I thought I’d sketch a car in the parking lot. When I arrived, I backed into my space (planning) so that I’d be facing toward other cars when I finished my postal business. I knew the driver of the Mercedes would return from the P.O. quickly (indeed, he did – immediately after I finished). Right after my errands, we were destined to see an exhibit at the Museum of History and Industry. The show was almost all photography, so I figured I wouldn’t have much to draw in there, but I wanted to find a way to squeeze in a sketch or two. The first opportunity came right after we’d ordered lunch in the museum’s café. It doesn’t take long to grill a couple of sandwiches (and you know me – I can’t sketch if I’m hungry and food is on the table! ), so I didn’t have much time, but it was enough to capture the Space Needle (still looking top-heavy due to its remodeling, which has grown tiresome to a native like me) through the window. As soon as the sandwiches arrived, I decided I was done. Before we left the museum, Greg stopped in the men’s room, so I looked around nearby. I’ve made leisurely sketches of the bright pink Lincoln Toe Truck on multiple visits to MOHAI, so it wasn’t new to me, but it’s always a favorite. 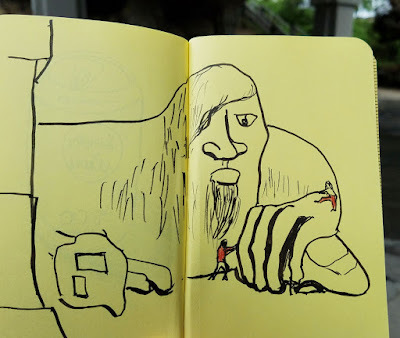 Again in my pocket-size Field Notes, I lightning-sketched that giant mobile foot and even had time to scribble on some pink by the time Greg was ready. 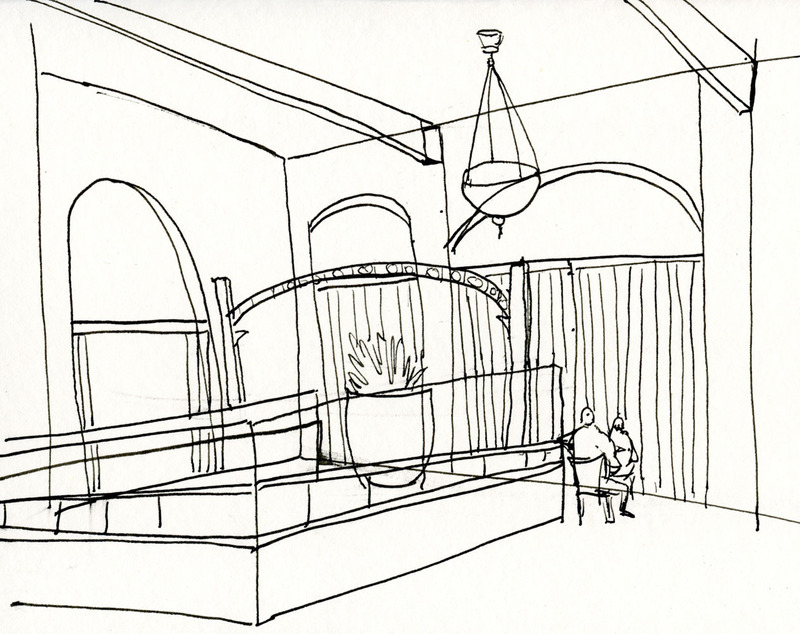 One of my favorite ways to flex my lightning-sketching muscles is watching the view out our kitchen window. Our bird feeder has been endlessly entertaining as well as endlessly useful in training my eye, hand and visual memory. Unlike the others (which took, literally, a few minutes each to complete), the sketches of birds shown below took quite a bit longer in total duration – each was completed over the course of several days – but I’d guess that the total amount of time spent on each sketch was still only a few minutes. These finches would give me a few seconds at a time, so I’d grab whatever gesture I could, from sight and from memory. 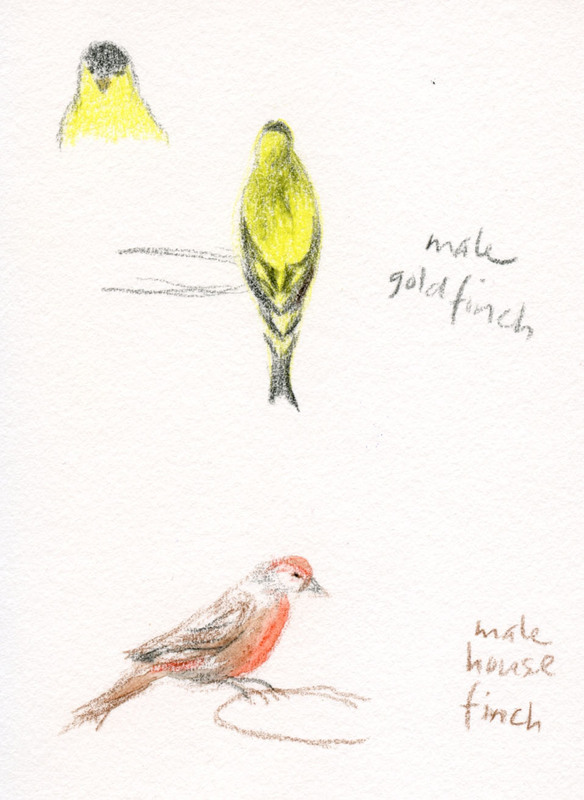 The next time I saw the same bird (or another just like it), I’d correct the gesture or add more detail. 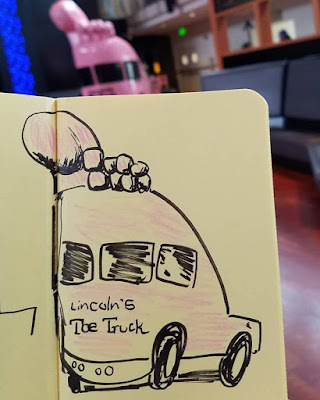 I remember when I first started sketching more than six years ago, I marveled at how quickly other sketchers seemed to work and wondered whether I would ever be as fast as they are. Over time, I have gotten faster and faster, although I don’t know how I’ve developed this skill other than through regular practice. When I have time, I enjoy working on a compelling subject, a more complex composition or more details, but I like having the choice of being quick if I need to. Regardless of subject matter or the reasons for being fast, my lightning-sketching skills are useful and worth continual honing. After wandering around the station a bit longer, uninspired, I zipped up my jacket (thankfully I wore my down) and went out to the street. Lending light but not much warmth, the sun appeared occasionally. On the corner of Fifth and Pine, I found a street scene I wanted to capture: The Monorail and the round twin towers of the Westin Hotel (plus a lot of scaffolding that seems to be marring much of the view in this area). With all the buildings that have been popping up (as well as torn down) over the past decade and especially the last few years, at least those two icons haven’t changed much since I was a kid. This is the kind of scene I would be attracted to if I were a visitor here, yet I take it for granted because it’s familiar. 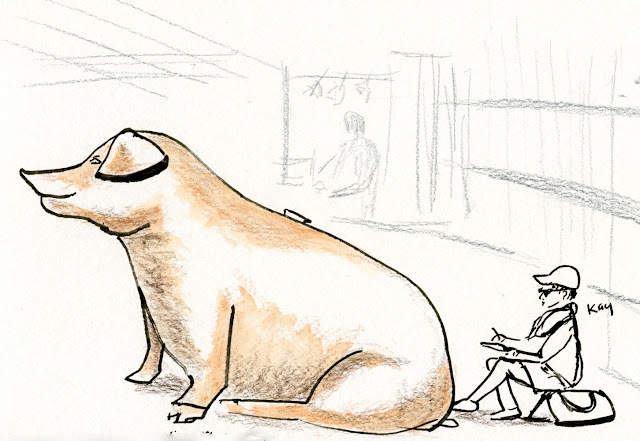 4/14/18 Kay focuses on people, not the pig, in Jane's workshop. 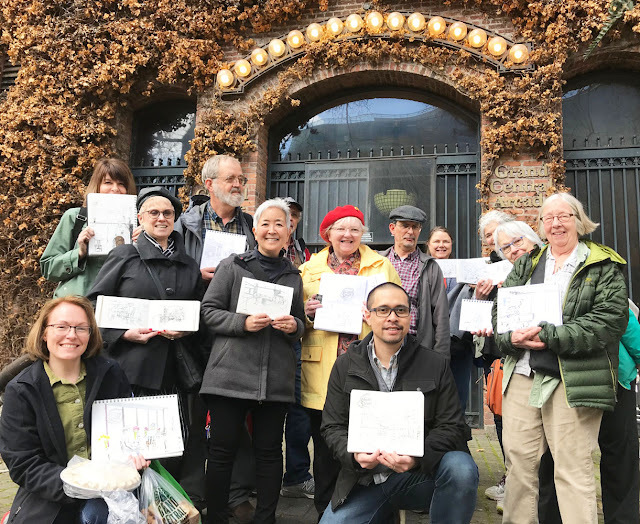 On a drizzly morning mobbed with the usual Saturday crowds, the Pike Place Market’s MarketFront sheltered Jane Wingfield’s 10x10 USk workshop students as they sketched people “inside-out.” Eavesdropping on Jane’s lessons and demos as I snapped photos and sketched her students, I found myself almost unconsciously following her principles: Focusing on essential lines of action and drawing in a fluid manner to capture gestures and movements. 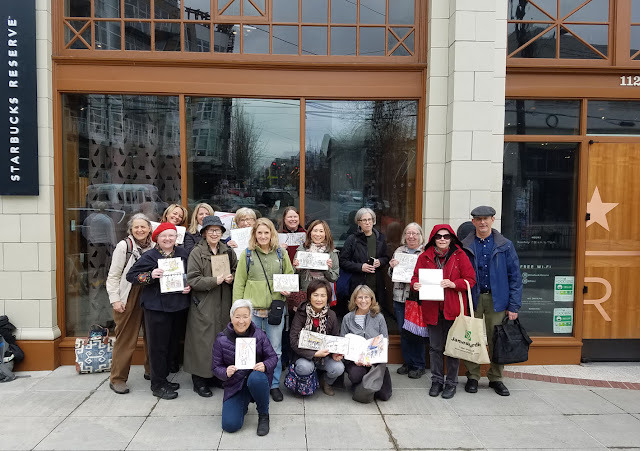 4/14/18 Jane and her students hard at work. 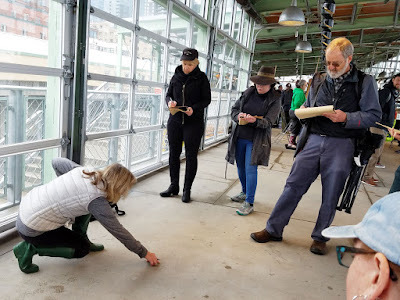 An interesting and useful exercise Jane used was to hold a pose (see photo below) for several seconds as students sketched her. 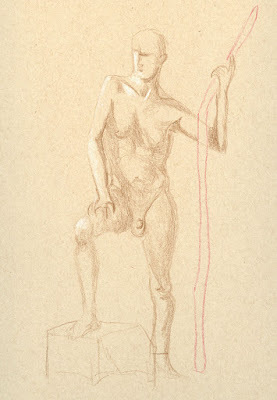 When she no longer held the pose, they were to continue finishing the drawing from memory – an essential skill to develop when sketching anything that moves constantly (I try to do this frequently with people as well as animals). She told me later that she gives her students this exercise because most people in public places like the Market are not making a wide variety of poses other than milling about or standing. Stopping for a quick bite at Michou Deli, I grabbed a stool at the windows looking directly out onto the sidewalk, where a long line of people waited their turn at Piroshky, Piroshky. Queuing people usually aren’t very active, but I still tried to capture their individuality by focusing on their posture. If you observe closely, there’s a line of action (or inaction) even when people are doing nothing but standing. can keep it in memory and continue drawing after the pose is gone. 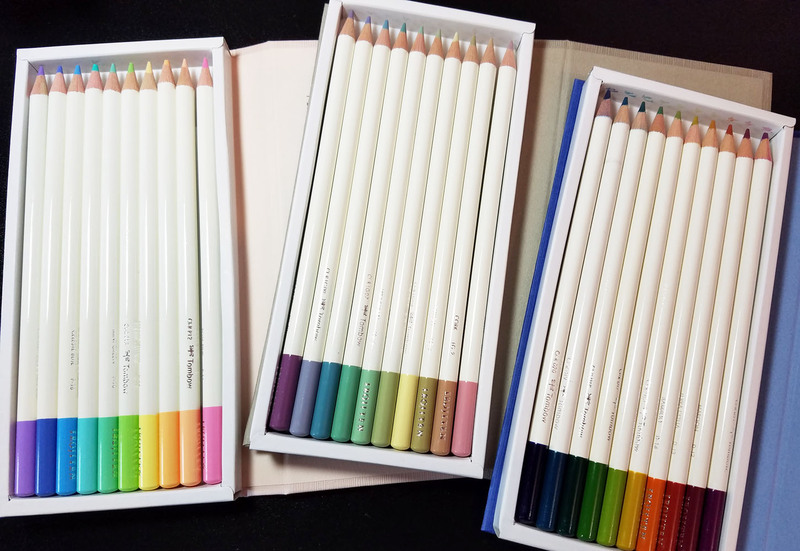 The full set of Irojiten colored pencils. This year Caran d’Ache commemorated the 30th anniversary of its Supracolor line by releasing a box of new, limited-edition colors (which, naturally, I couldn’t resist). 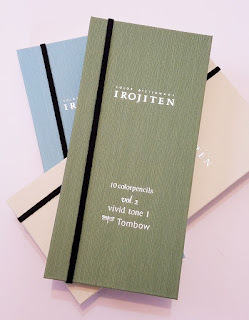 Earlier this month I learned that another art supply company was celebrating the 30th anniversary of one of its own colored pencil lines – Tombow’s Irojiten. How could I celebrate one colored pencil anniversary but ignore the other? Fortunately for my credit card, Tombow didn’t put out new colors, but I did haul out the set of Irojiten pencils I’ve owned for years (since even before I began sketching), mainly to give them a second chance (and finally write a review). This is hard for me to admit because it’s acknowledging how shallow I am, but when I first bought the set, it was 99 percent for the packaging. Irojiten means “color dictionary” in Japanese, so the collection’s 90 colors are arranged in three slipcased sets, three “volumes” per set. In subdued, earthy tints that the Japanese favor, the “book covers” feel like fabric, and they look like beautiful books. With most colored pencils, I like to take them out of whatever tins or boxes they came in and store them in wide mugs or vases on my desk so that I can see and grab them easily. The Irojiten set is the exception: They need to be kept in their lovely volumes. 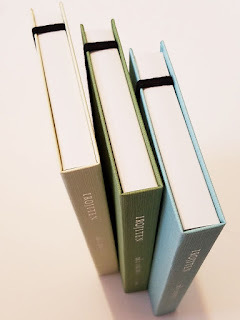 Each volume is a clamshell box held closed with an elastic strap. (The elastic on the left will probably strike Westerners as being backwards; the “book” opens from left to right.) Inside the lid are the color names and numbers in English and Japanese. Color names in English and Japanese are in the clamshell lid. Elastic bands hold the "books" closed. The round-barreled pencils are heavily lacquered in shiny white with a colored end cap indicating the color. The color name and number are printed in silver on the barrels. 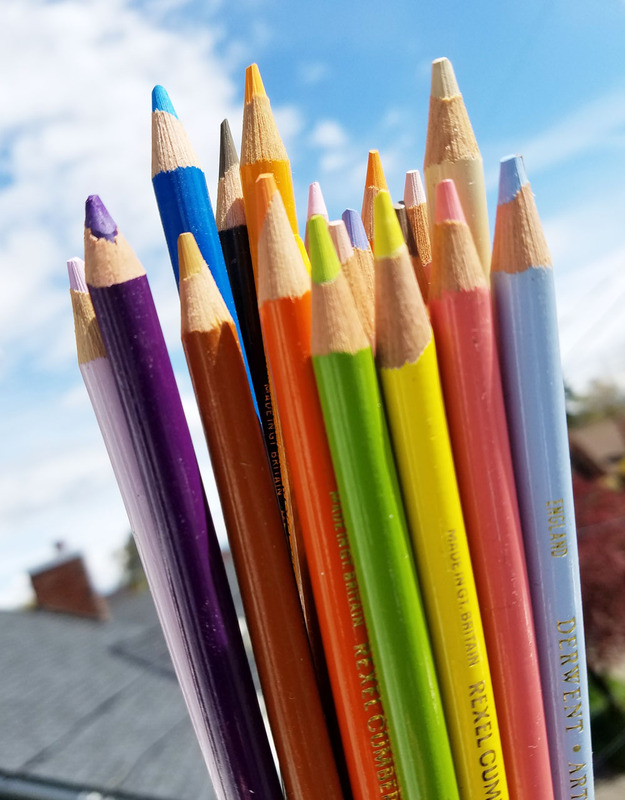 While 90 colors is a relatively narrow range compared to, say, Caran d’Ache Supracolor, Prismacolor or Holbein (which each have 150), it’s a perfectly functional and varied range with no near-duplicates. While the labels Tombow uses – “vivid,” “pale” or “deep” – don’t do much for me, I am enamored with the selection of colors within each three-volume set. For example, volumes 1 – 3 (which are the most versatile, in my opinion) include 10 primaries that you’d expect in any basic set, 10 medium tints of primaries, and 10 shades. It’s like a color wheel lesson in a slipcased box. You could buy this single three-volume set and have a solid range of 30 colors, including some unusual hues that you might see only in another brand’s larger set. Likewise, volumes 4 – 6 are an intriguing range of color intensities (though less versatile if it’s the only set purchased). The least versatile range for my use is volumes 7 – 9, including 10 fluorescent colors, which I had an odd experience with a couple of years ago. As you know, one of my favorite urban sketching subjects is heavy equipment at construction sites. Often the barriers, signage and workers’ vests are fluorescent orange, and one day I remembered these neon Irojiten colors. 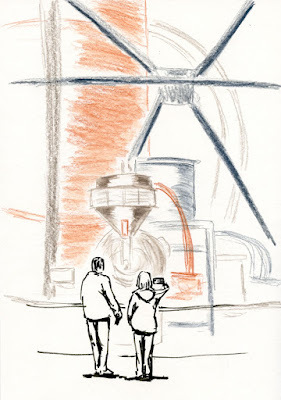 I carried the orange with me for a while, and the next time I sketched a construction scene, I happily pulled it out. 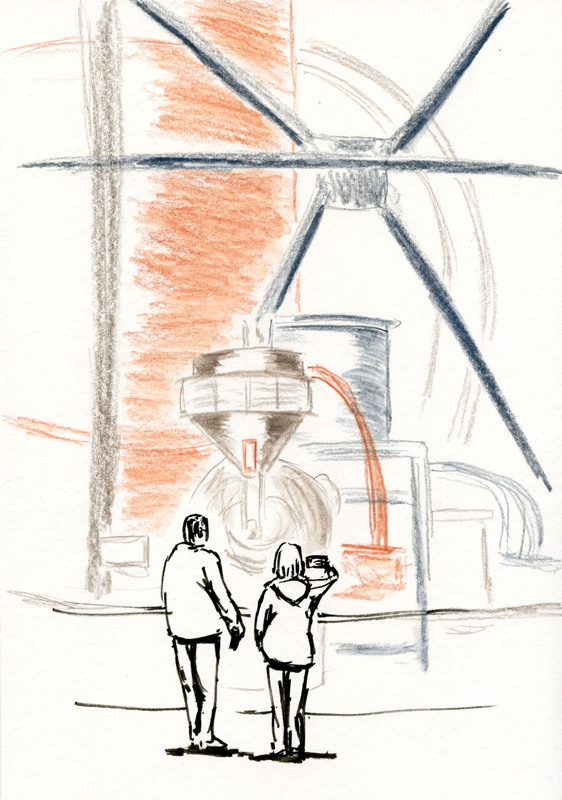 It looked great on paper, but the strange part was when I scanned and photographed my sketch – the color did not look fluorescent at all. In my samples below, the photographed green and pink are closer to the colors on the page, but the orange (which looks fairly close to the pencil’s end cap) is entirely different on paper. 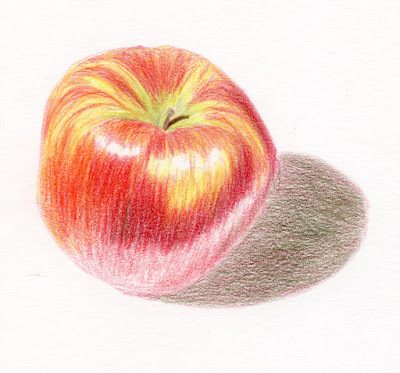 It didn’t seem worth carrying this one additional pencil if the color was so inaccurate when photographed or scanned. Very strange. Fluorescent orange on paper looks very different from this image of it. 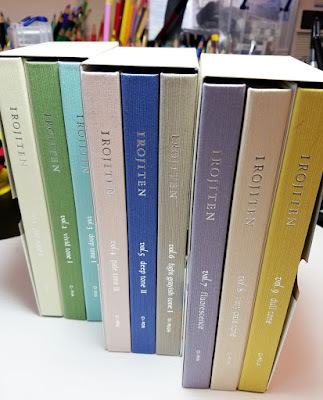 Neon colors notwithstanding, the Irojiten set seems like it should be versatile and useful (beyond having the most gorgeous packaging in my collection), but for some reason, I never warmed to it. During early trials, I was convinced that the cores were harder than I liked, and I was having difficulty finding them open stock, which bothered me in principle (never mind that I didn’t use them enough to need replacements). I loved them so much in appearance, though, that I didn’t care if I ever used them again; some pencils are perfectly acceptable as nothing but home décor. With Tombow’s recent promotion of Irojiten’s 30th birthday, however, I started thinking it was time to give them another chance. 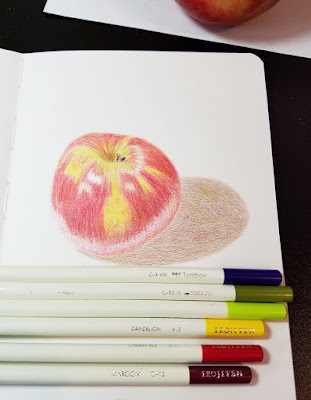 Maybe my taste or tolerance for harder pencils has changed over time (and with more experience – I know now that there’s a place for different degrees of hardness), because this time they didn’t feel hard to me at all – I’d say they fall somewhere between Faber-Castell Polychromos (harder) and Caran d’Ache Pablo (softer). 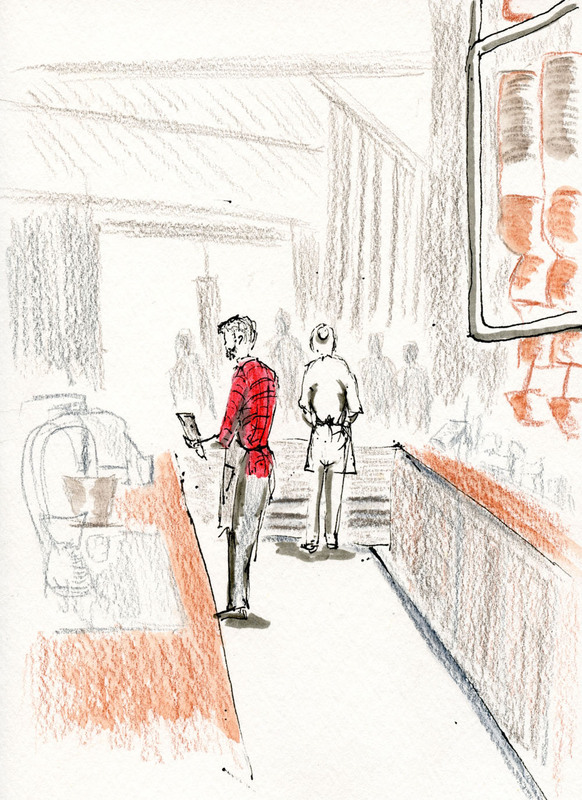 In fact, I started a sketch in a toothy Stillman & Birn Alpha sketchbook and thought it wasn’t a good match – it was taking longer than I wanted to cover the texture with the soft core. 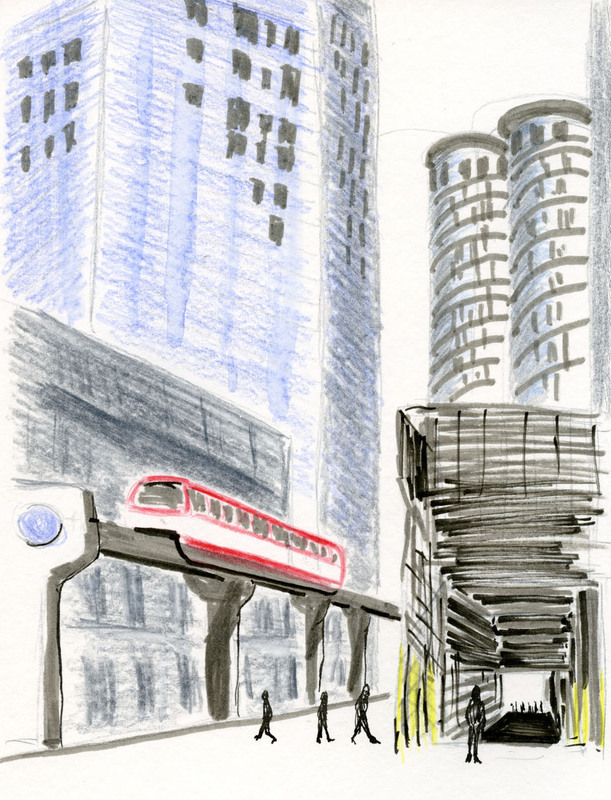 I switched to smoother Epsilon (my apple sketch shown below) and was happier with the coverage, which also went faster. Creamy without being waxy, they apply and blend well. 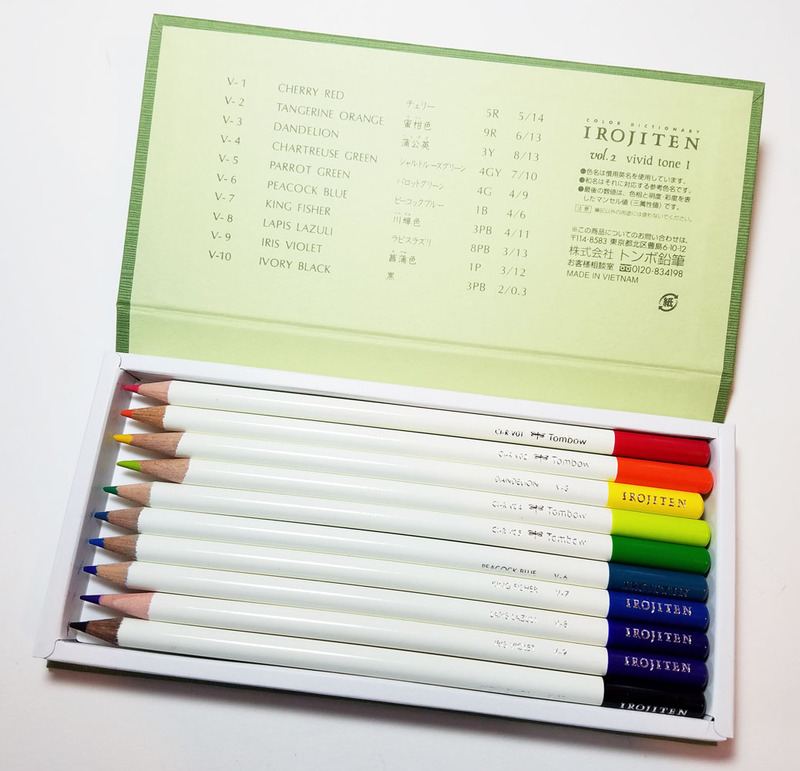 With the passage of time, another advantage became apparent: Irojiten pencils are readily available by open stock (on Amazon and elsewhere). 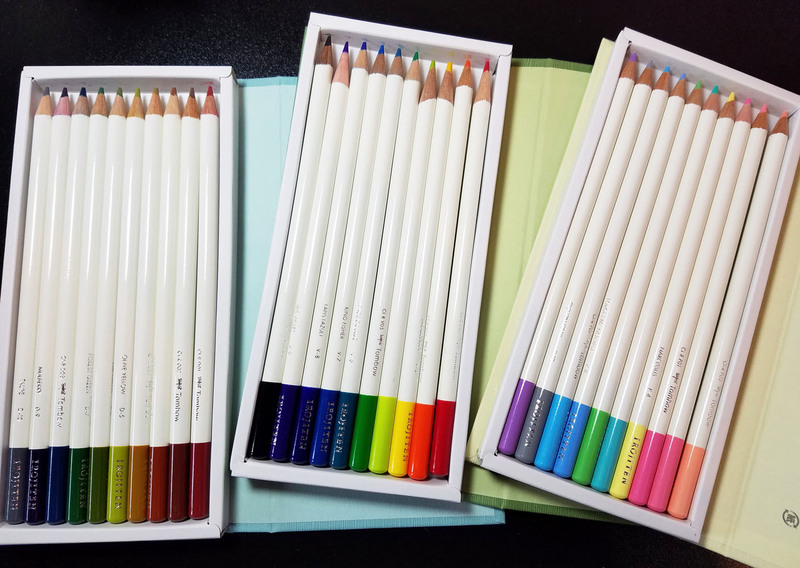 Since I don’t like to recommend pencil sets that can’t be replaced individually, now my conscience won’t bother me to recommend these. In fact, normally I would recommend buying a small set of any pencil and then supplementing with individual colors that suit your typical subject matter and preferences rather than buying a huge set. But in the case of Irojiten, I’d be hard pressed to make my usual recommendation . . . how could anyone buy just one set of these lovely volumes and then add a few random singles? Where would you store them? 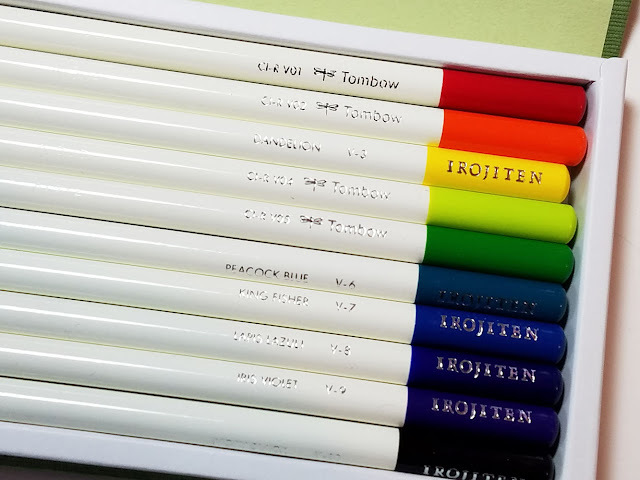 I must say that if I were Tombow, I’d have issued additional volumes of colors by now. It seems like a missed opportunity. If I owned a small set of another brand and wanted more colors, upgrading would mean buying a larger set that probably includes duplicates, or else buying economical open-stock singles, which would hardly be a marketing opportunity. But with Irojiten, it would be so tempting and easy to add new volumes of unique colors without hesitation. Thinking about this brought to mind Fellissimo, which is a Japanese colored pencil brand with 500 colors. They are sold only by subscription. Fellissimo hues are known for having evocative but ridiculously unhelpful names such as “Sunshine Swims” and “New Bike.” Every month, subscribers receive 20 unique pencil colors (price: 2,808 yen per month), and at the end of 25 months, they would own the full set, “the magnificent experience of a lifetime” (according to its website). When I first heard about Fellissimo, my head exploded. For about two hours, I was completely obsessed with the possibility of becoming a subscriber. Google searches led me to realize that a large part of the subscriber experience was using the pencils not as an art material but as home décor (which, as you know, is a concept that I’m not unfamiliar with). Further research (including a chat with someone who had received samples during an early promotion) indicated that the pencils are, in fact, better as home décor than as an art material (hard, scratchy, lacking pigment). Discouraged, I considered subscribing only long enough to receive one month’s worth, just to experience a tiny fraction of that magnificent lifetime, then quitting. 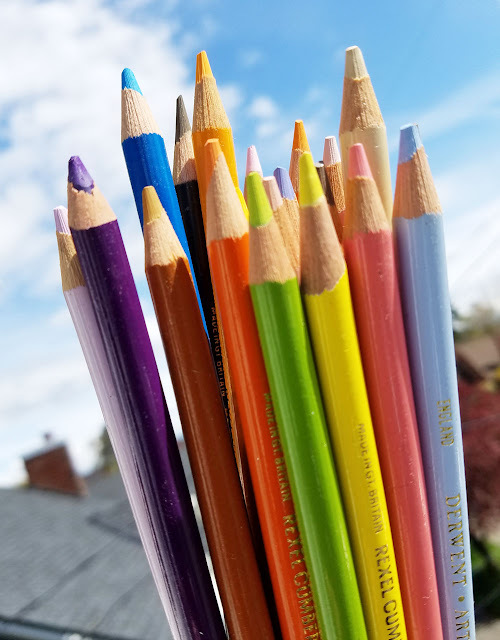 Unfortunately, the final nail in the proverbial colored pencil coffin was that there is apparently no way to end a subscription once it is begun (at least, the English-language Fellissimo site offers no FAQ or fine print related to such). I stuffed the pieces of my head back into my skull, and that was the end of that. How does that relate to Tombow Irojiten pencils? Not at all, except that Irojiten are both home décor and an art material that I am now happy to use. You must see Fellissimo (but wait until you have time for a head explosion).